I didn't take many photos after it was unloaded, prior to diassembly. The bare spindle, with an adapter plate of some kind. The rod in the foreground was connected to an air cylinder. I was told the previous owner used it to actute a collet chuck. The tail stock. 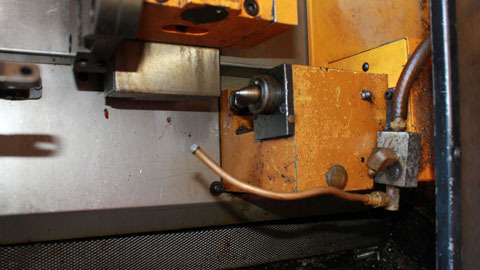 This machine was equipped with a pneumatic tail stock. There are some limit switches to tell the control of it's position. I will be including it in the conversion. The turret holds 4 OD tools and 4 ID tools. The setting up EMC2 for the turret is intimidating at this point, but I have an example and someone that's offered to help. Disassembly begins. Some of the panels have been removed. The amount of dirt in the machine is amazing. Chips and sludge in mounds. The Z axis ballscrew unfortunately shows slop. I'm uncertain of the source. The X axis feels fine. The bare lathe bed and chip pan. There a quite a few panels, cables, etc., to remove to get to this point. I was concerned about removing the headstock to clean the bed casting, but it turns out there are built in alignment devices to get it set up when it goes back together. 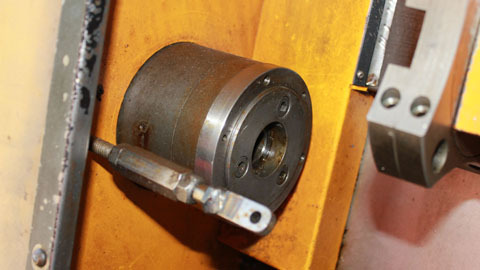 There is a Yahoo Group for the small Emco lathes. The ways are slightly stained, but otherwise look good. I've been colecting the necessary parts for the conversion. The original motor is a separately excited shunt type. This is basically useless without the original control. 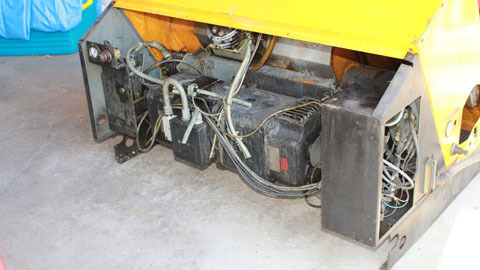 And even then, no good for me as it requires 220 three phase and the Emco transformer to boost the 220 to 380. All of these machines require that transformer to run the original control. So The motor is being replaced with an ABB EIC 100 frame motor, and an open loop vector VFD. 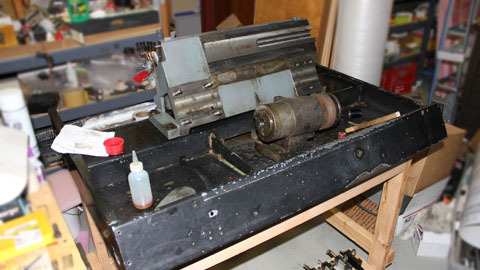 This should give virtually identical power to the original spindle drive. I've also found some servo motors and I've had Gecko drives waiting for the CNC lathe project for a while already. I'll be using Mesa Electronics cards for this conversion. I decided on the 7i76 and 5i25. Yes, the 7i76 is geared for steppers, while I'm using Geckos and DC servos. Initially it will run "open loop" like steppers, but there seems to be a way to get closed loop in EMC with steppers these days. I spent several hours cleaning the chip tray and panels. I must have pulled out over five punds of grease and chips from behind panels and in the tray before even thinking about washing anyhting. We had a very mild winter day so I gathered the parts and hauled them over to my parent's house to pressure wash. The sludge stuck on this machine was tenuous. The detergent for the power washer didn't even touch it. I'm sure the balmy 39°F temperature didn't help. I ended up using a spray bottle and a half of Zep Heavy Duty Citrus Degreaser and scrubbing with a brush, all parts at least twice, blasting away the grime with the pressure washer in between. Now, I have some mostly clean parts sitting in the garage. I wiped the ways of the bed casting dry and sprayed them with Corrosion-X. This project has been on hold for a while now and I'm finally able to put some time in on it. I built a simple wooden stand for it to get going. The stand will house drawers and the PC to operate it. 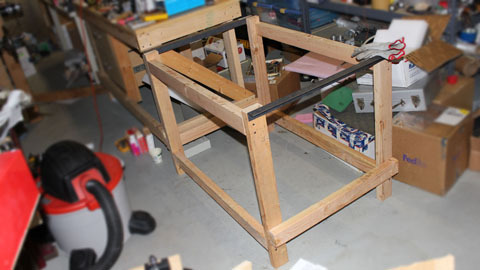 The sides will get covered to add rigidity to the structure. It's not ideal, but I don't weld and can't spend the money right now. I put the base frame and chip pan on the stand and mounted the bed casting. The bed casting is not as bad at it looks in the photo. The spindle needs a cleaning and I may strip it down to the casting to make sure it's clean inside as well. If the spindle must be disassembled, study the spindle drawing in the parts diagram. The pulley is secured with a nut which nests in the back of the pulley flange. There is a set screw in one of the two holes which must be loosened. The nut is then removed with a pin spanner. Now, the pulley is removed with a puller. Loosen the set screw in the bearing preload nut before removing the nut. At this point the spindle is pressed out leaving the bearings in the housing. The nose cap is removed and the inner race of the nose bearing can be accessed and the outer races pulled. The bearing races are a light press fit. There is a labyrinth seal with close tolerances in the front cap so do keep the spindle square when pressing it out. 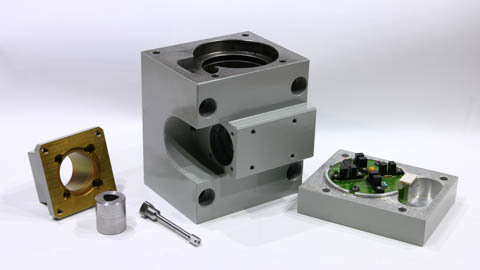 Keeping the spindle square shouldn't be a problem with both bearings in the housing. Bearings are listed as 32009XA P6, but I'm unsure if P6 is standard quality in this type. I suspect not. Update: P6 is standard precision. There was a lot of orange looking slime in the housing. None of this was in the bearings. 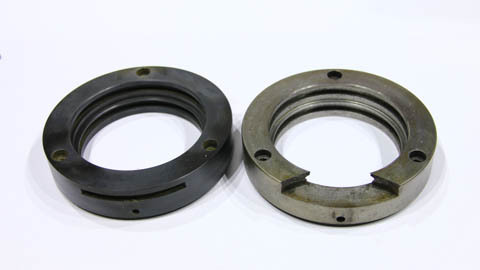 There is a ring behind each bearing which acts as a dam to allow dirt to settle without reaching the bearing. 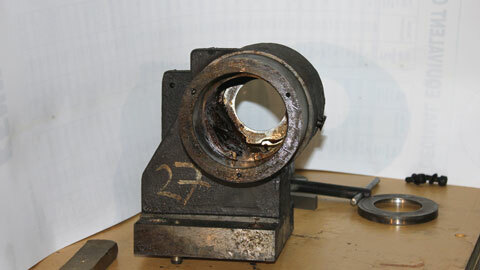 There are signs of pitting in the dams and retaining rings, but the bearings were clean. The nose bearing has seen better days and will be replaced. Spindle and carriage components cleaned and ready for reassembly. 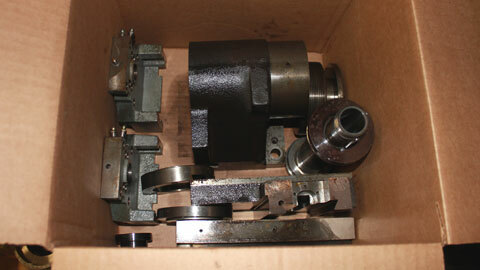 Spindle bearings arrived, but ballscrew bearings still need to be ordered. 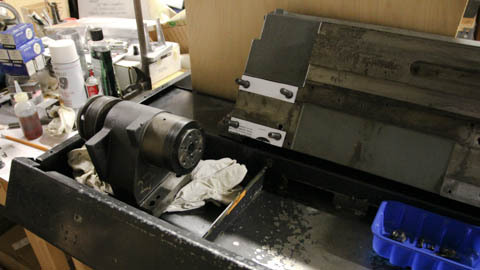 The original spindle bearings were 32009XA which makes it a special. Just what was special was not easy to discern. 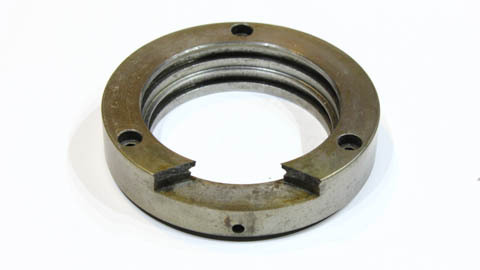 The 32009XA listed in the Timken catalog didn't match the original bearing only in shoulder dimensions. The ratings for the three Timken 32009 bearings were the same. I searched Ebay for a good deal and bought a pair of Czech made ZKL 32009AXP5. The P5 tolerance class has significantly better runout specs for only a small increase in price. After a long break this project is moving agian. 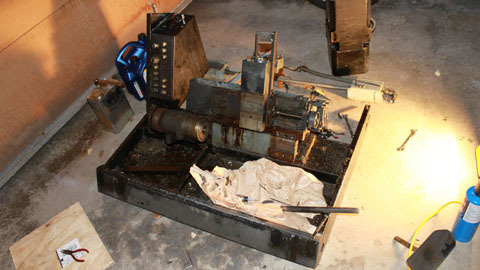 The last thing I did was to clean the parts and begin reassembling the spindle. I heated an inner race and quickly slipped it onto the spindle shaft. Approximately 1 second after the bearing grabbed tight I realized the bearing cover was not inplace. 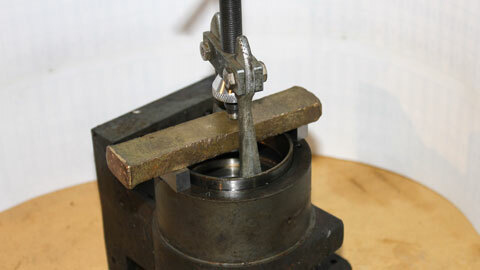 The bearing cover must be over the spindle prior to installing the bearing because the cover won't fit over it. This caused all sorts of grief as the bearing has only ~1mm of clearance to a large shoulder. After checking with people and places, I ended up making parts to pull the bearing myself. At this point things stopped and I decided I would make a new bearing cover. The one I have is cracked. It likely wouldn't cause any problems, but is easy enough to make. Since it would require stripping the machine completely to make later, I decided to do it now. 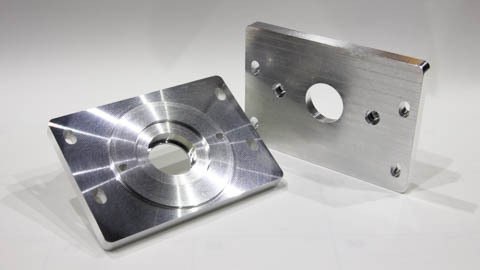 Material for the bearing cover and chuck adapter is on the way. I'll try to disassemble and clean the turret in the mean time. The new Bearing cover is made. Made of cast iron this was not to diffucult. I hope to make more consistent progress now. The spindle is reassembled. Bearing preload not set and will be done when the motor is installed. There were paper shims under the spindle when I took it apart. I didn't pay particular attention to thickness. Glossy card stock was used to make new shims. 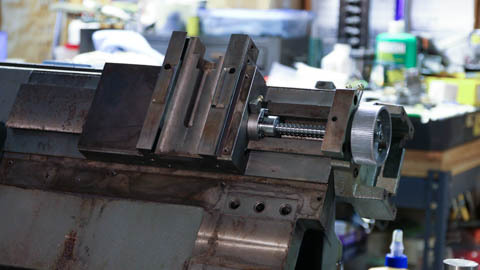 Shimming the headstock, turret, and tailstock allows for bringing these components to the same center height. 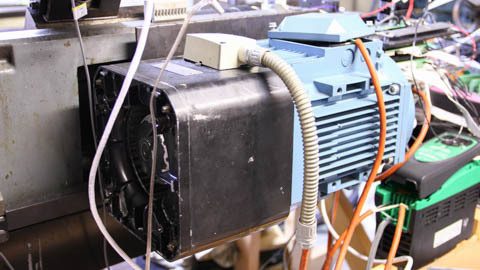 The motor I chose is an ABB M2AA100LA-4 rated 1720 RPM and 2.5kW at 250VAC, 60Hz with delta connection. 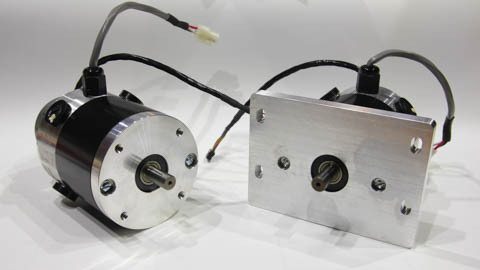 This motor will provide virtually identical power and torque to the original DC motor. 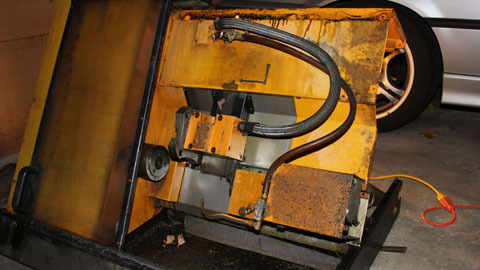 The shaft is an identical match and the footplate very similar. I added threaded holes in the Emco mounting brackets to match the rear bolt holes in the motor's foot plate. 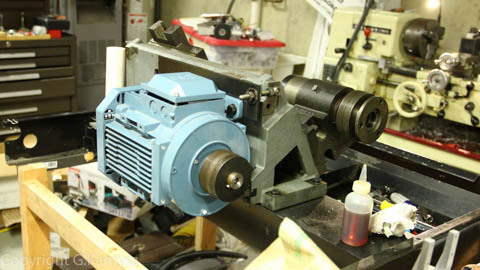 The motors is mounted and with the motor pulley installed as close as possible, the pulleys align perfectly. The ball screws showed signs of wear. The X axis was acceptable, but Z had obvious play. I measured the balls best I could in a Mitutoyo digital mic and ordered new balls slighlty larger. 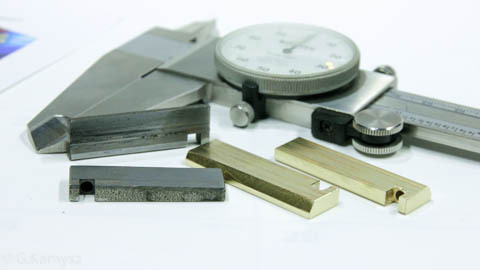 1-2 ten thousandts of an inch makes a big difference so usually you order several sizes when reballing. For X, I ordered virtually the same as the old balls measured (old 2.381mm, new 2.38125mm or 3/32"). For Z, I purchased two sizes slightly larger. The old balls were 2.358mm, new 2.37269 or .093413". I didn't end up using the .093616" balls. I've had experience reassembling several ball screws lately, so this was an easy job and took maybe 15 minutes total. Keep your work area clean and use clean grease to hold the balls in the tracks. Use a filler tube just smaller than the minor diameter to keep the balls in the tracks while inserting the screw. Pay attention to the orientation of the grease fiting on the Z axis when installing the ball nut. It should point up when installed in the lathe. This is not critical for the X axis as it will be accesible either way. The Z axis ball screw is installed. To avoid binding the ball screw, I installed the bolt on the ball nut and bearing mount loosely and brought the carriage toward the bearing mount and tightened the bolts. 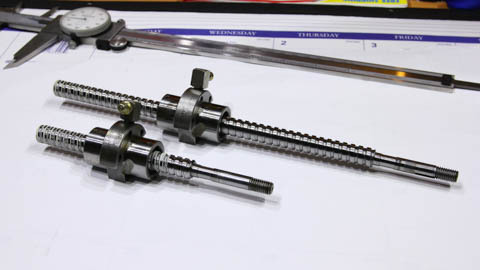 The nut which holds the pulley on the ball screw also sets the preload on the ball screw thrust bearings. This must be set for a small preload. If you replace the 608 ball bearing, it should have a large shoulder on the inner race. Not all replacements will have a shoulder as large as the original. The old X axis gibs didn't look very good, so I made new gibs from aluminum bronze. I used the old gibs to set the taper angle. The thickness is important as a small difference will make the gib useless. The X axis was then assembled. There is a spring counterbalance that still needs to be installed. The original servo mounts have large holes in them and wouldn't work with the servos I have. Short shafts on the new servos further complicated things. I decided to make new front endbeels for the motors with integral mounts. The original servo and the new front end. Servos installed. These servos have 5000 count encoders which will give a resolution of 0.5 micron (.00002") on Z and 1 micron (.00004") on X. This is overkill but should allow for fine corrections for worn bed ways if needed. 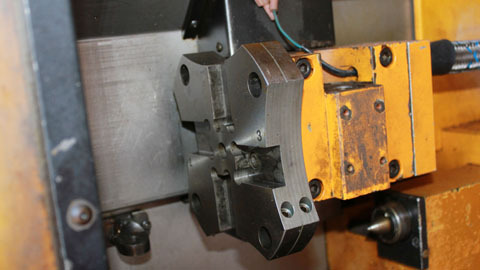 The original steppers provided 2.5 micron (.0002"") and 5 micron (.0004"), even though Emco advertised 1 micron accuracy. Work has progressed on the lathe, but I have not kept up with updates. I decided to change to Mesa 7i77 to take full advantage of closed loop servos. The servos turned out to be 5000 lines or 20,000 quadrature counts per revolution. I was concerned the old Renco encoders might be slow, but the planned 4000mm/min rapid the frequency is well within limit. They could be faster with a 60V power supply, instead of the current 48V. The servos are driven with AMC 6 amp amplifiers in torque mode. Tuning took some time, mostly because the information found online is for velocity mode. The tuning approach for torque mode is very differnt. If I was doing this again would buy new AC brushless servos and drives. The cost is higher then Ebay finds, but a servo with built in encoder would be easier to work with and tune. 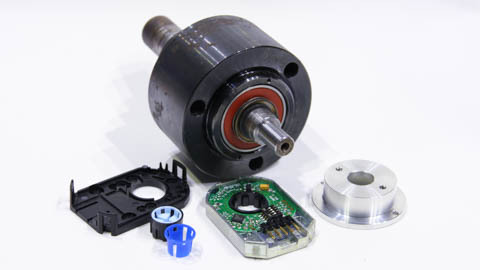 I chose an inexpensive CUI Inc. AMT-102 encoder with quadrature and index for the spindle. Quadrature output allows rigid tapping in Linuxcnc. The orignal encoder shaft was turned to fit the 8mm adapter and a mount made to fit the bearing housing. This encoder has configurable resolution. 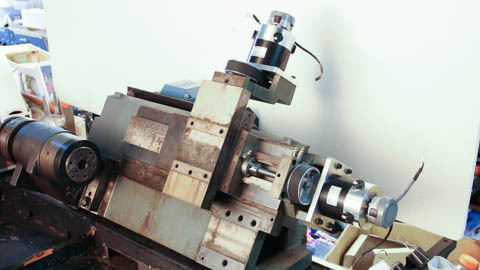 Mesa hardware allows full 2048 PPR up to the 5000RPM spindle speed. New home switches are installed. At this point, both axes are working, the spindle runs in both directions, and spindle synchronized motion (threading and tapping) is functional. 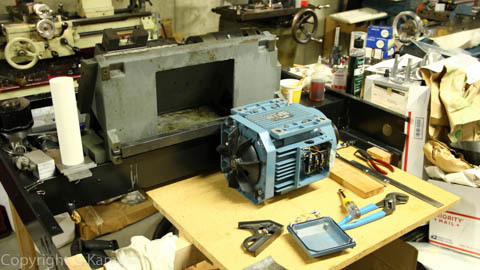 The old spindle motor blower was saved and with a little modification installed on the new spindle motor. 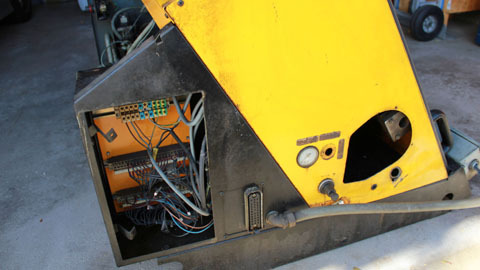 The blower motor is also three phase and will be driven by a small VFD. The SK Commander series VFD has PID capability and with a tempeature sensor should maintain motor temperature without additional signal input. 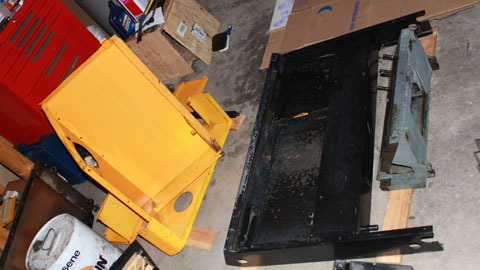 The turret components have been disassembled, cleaned, and painted as needed. 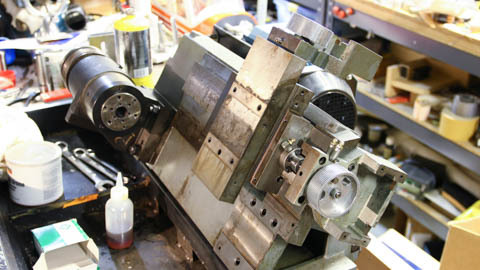 The old turret indexing motor will be replaced with a brushless servo to speed up indexing. This required a new mount and torque shaft to connect to the worm gear. The old turret position encoder is still functional and will be reused.